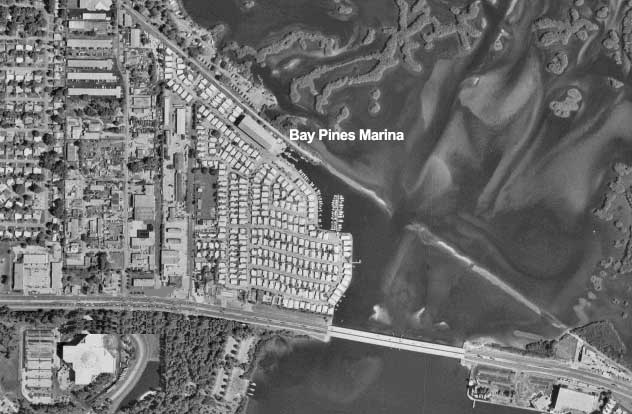 Bay Pines Marina is located in the heart of the tri-county Tampa Bay area. It is 2 1/2 miles to John's Pass and the Gulf of Mexico. The barrier islands of Clearwater beach, Belleair Beach, Indian Rocks Beach, the Redington beaches, Madeira Beach, Treasure Island Beach and St. Pete Beach are all within close proximity to the marina and can be cruised inside the intercoastal waterway or along the beaches on the Gulf of Mexico. It is located in the midst of a boaters paradise with waterfront restaurants, pristine white sand beaches and city, county, and state recreational parks. The Google maps image below will give you a good idea of the location relative to all the waterways surrounding and included in Tampa Bay. After checking out the Google maps, take a look at the link below for Marinas.com which will give you a more visual preview of the marina and supply you with the current weather, navigational and tide charts to direct you to the marina from the intercoastal waterway.